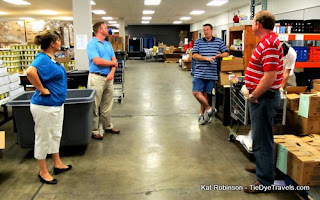 We met with several of the good folks that run the place and learned about the many missions the Rice Depot operates. I think a lot of misconceptions were blown away. First things first. 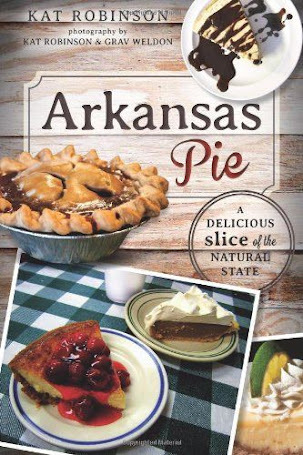 The Arkansas Rice Depot isn’t just about rice. 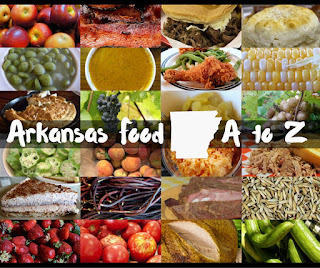 It’s about helping feed the hungry all across Arkansas through various programs like Food for Kids, Food for Seniors and Food for Families. There’s a Rice Depot program in every county in Arkansas. 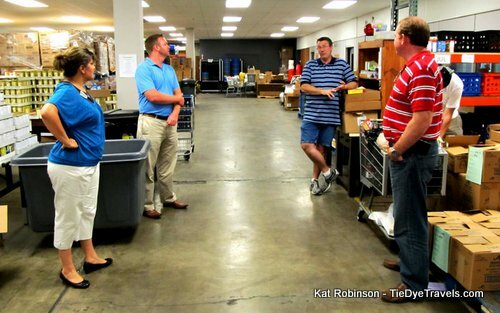 The whole operation employees just 20 people… and with low overhead the organization is able to turn 99 ½ percent of donations and funds right back around to serving hungry Arkansawyers. We had a quick lunch with the Rice Depot folks before our tour of the operation. We watched a film and then talked about the mission’s purpose and how it helps. 400,000 people receive food through the different programs the Rice Depot offers. That’s nearly 14 percent of the state’s population. We took a look at the items offered in the Food for Kids program. It kinda breaks my heart, thinking about kids who don’t have access to food at home for whatever reason. We even talked about kids that are locked out of their homes over the weekend. That just ate me up. 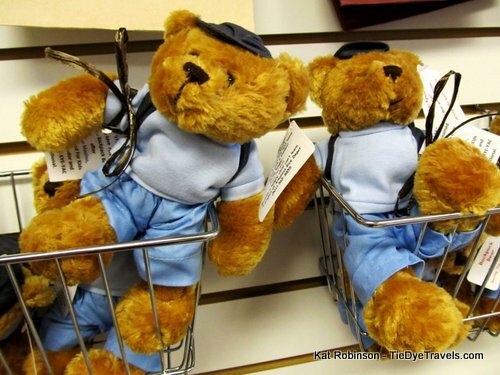 These kids don’t have to apply for the backpack program. Their teachers or counselors will make a recommendation to the person coordinating for the program at the school, and that person might take them aside and let them know it’s available to them. They go by in the afternoon as they’re leaving school and pick up a backpack. 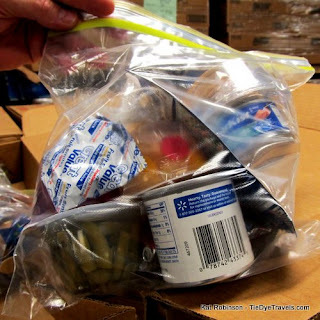 Depending on the situation, the backpack might contain enough food for an evening or for a weekend — and in some situations, for multiple children in the household. They’re all unmarked backpacks (the clear ones in this photo are just there to demonstrate what goes inside). The items inside are for the most part single servings that can be opened by a child — and in most cases, don’t require heating. We’re talking fruit and pudding cups, vegetable cups and cans, cereal and granola bars, macaroni and cheese that only requires water, canned items with pop-tops that come fully cooked and jars of peanut butter. This could be the difference between a hungry, distracted student and one that’s eager to learn. We heard stories of how children improved after having that one extra meal made available to them. We also peeked into the Coat Closet, a room that's full of coats, gloves, hats and other clothing to distribute to those who need it. All of these items are brand new with tags. 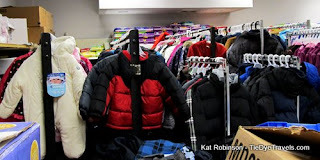 We learned that for many of the kids who are on Food for Kids, this might be the only new item of clothing they receive each year. From there we went back into a large room filled with all sorts of products. This is where kits are assembled for the different programs. 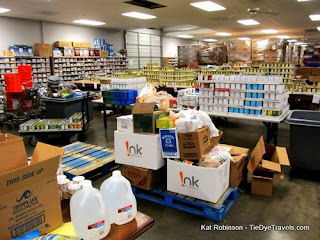 One wall contained bins filled with items for the Food for Seniors program. 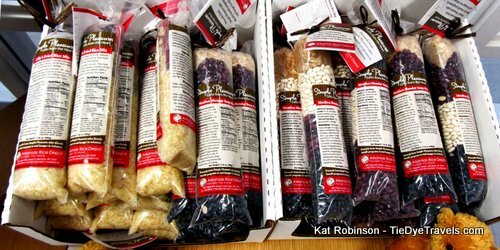 Unlike the Food for Kids program, the items in the Food for Seniors program kits include items that need to be cooked or assembled. The idea is that seniors who are on the programs need the independence of putting together their own meals. Volunteers take 50 pound boxes of food out to seniors once a month; for the most part, it’s the same volunteers visiting the same seniors, giving the chance for interactions and friendships to grow. There were a lot of cans in the center of the room. Joe Rogers, the volunteer coordinator, told us the cans had come in without labels. A lot of the donations are like that — they may be a little bent up or dented, but they’re still viable. Volunteers had been securing new labels to the cans to let the recipients know they had a can of green beans on their hands. Joe explained that a lot of the donations that come in must be repackaged — for instance, potato chips that needed to be repacked into individual packages. Makes sense to me. He also showed us disaster packs, like the ones that went out to the folks in Vilonia after the storms this past April. Each one of these little packs has enough food to get someone through a day, plus three pre-pasted toothbrushes. The cases of these products are assembled and set back just in case of a disaster so they can be distributed quickly. 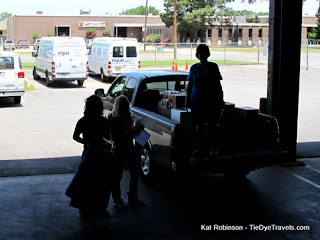 We went from there back to the big warehouse… which looked amazingly full of items. There are two major non-refrigerated sections and a freezer in the middle. 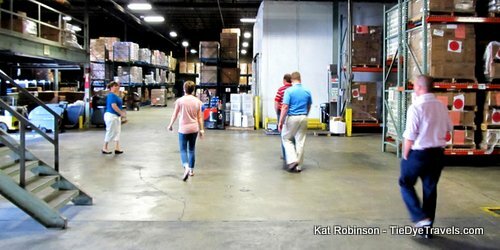 Turns out, the Rice Depot has to pay $1500 a month for off-site refrigerated space to store a lot of those donated goods; a future capital campaign will address that need. While we were in the warehouse, there was a group from the Otter Creek Assembly of God there to pick up stuff for their pantry. The pantry program, Food for Families, is largely run by volunteers from church groups, businesses and local charity operations all over the state. 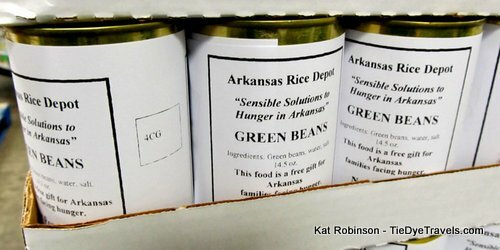 They come to the Arkansas Rice Depot or to a designated drop-off point to pick up food that they’ll then distribute to families who come to those pantries. We ended our tour at the Simple Pleasures gift shop. This is probably what you think of when you think of the Arkansas Rice Depot — a lot of rice, right? These mixes have been individually created, mostly by Depot president Laura Rhea (and a couple by Lilly’s Dim Sum Then Some’s Kathy Webb). 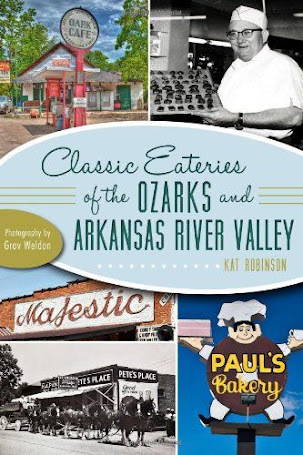 They range from Arkansas Dirty Rice to Hillbilly Chili to Presidential Parmesan, and just about everyone I’ve tried so far has been good. They’re cheap, too — and if you go straight to the Rice Depot you don’t pay tax or shipping on them. You can even make a box of your own — fill it up with a little crinkled paper filler, bags of rice and bean mixes, wassail mix, J&M cheese straws, cute teddy bears and the like. 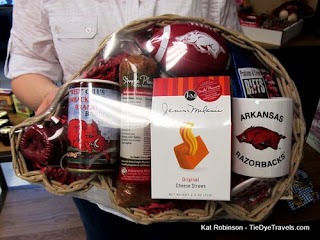 What a great quick gift idea? 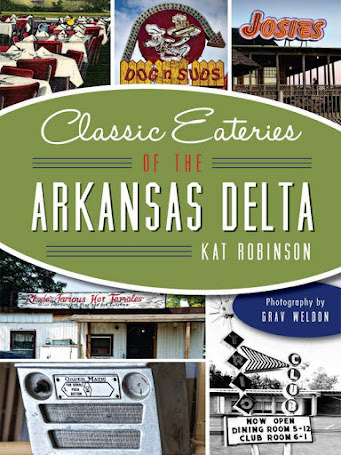 So, are you interested in touring the Arkansas Rice Depot? Won’t take much to schedule a visit. 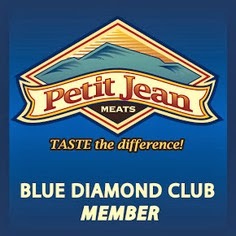 Check out the organization's website or call (501) 565-8855. UPDATE: The Arkansas Rice Depot is now part of the Arkansas Foodbank Network. It's located down 65th Street, a few blocks away. Shop for rice mixes and other items here.